I’ve been a bit behind on the blog. I’m in the process of moving. A major motivation behind wanting to move out of my small studio and into an actual house is to have more space for nieces and nephews to visit. Which I did. I am very excited about moving, but it’s a total time sink right now. I will be posting updates on how the kids like the new house, but in the meantime, here’s a cute photo of Dash and Jack-Jack, who love the walk-through closet upstairs. Excellent prospects for building forts! Duration of activity: 30 years, according to the bank. Cost: All your money. And then some. Child/aunt fun ratio: 40/60. 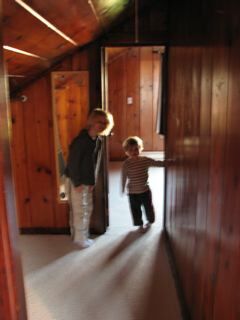 The kids are really enjoying playing in the empty house. The fun factor for me is somewhat mitigated by the work factor getting ready to move in. My fingers are covered in paint as I type this. I was telling P & C last night that I feel like I am getting to know Violet, Dash and Jack-Jack throught this blog! Congratulations on your move. Can’t wait to check it out! I want to see your house before I go. When Emily (that’s Scheimers right?) gets out of school, can we come up and visit the clan? @ Anne: Yep, that’s you. I hope you can come up after school gets out and stay a bit. That’s the whole point of having the new house.